Health and Safety Executive figures for 2001/2002 show that 38% of over 3 day injuries reported were caused by manual handling. A further 15% were caused by moving objects, vehicles or falling objects. HSE guidelines state that a runaway pallet truck should be stopped by lowering the forks. However this requires the operator to pull the pump trigger which they may not be in a position to accomplish. 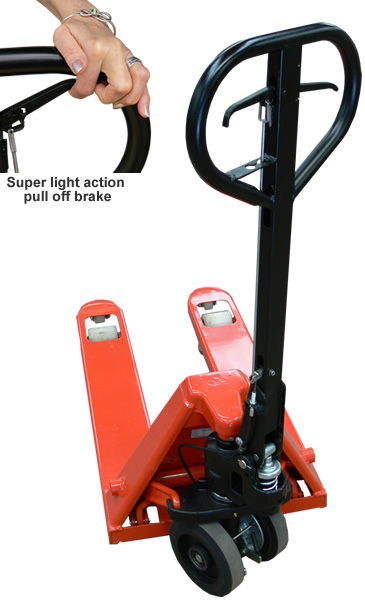 The operator must release the brake to move the pallet truck by holding the super light action brake lever. The pallet truck has an effective automatic parking brake whenever left unattended. In the event of the operator loosing control through tripping etc., release of the pallet truck automatically applies the brake. Though not designed as a brake for stopping loads, it may be used to assist in control of the pallet truck on inclined surfaces or in close proximity to other persons. Our designer and engineers evolved the Deadman brake to offer extra operator safety, robust components and ultimate ease of use. A tough steel rod/lever system and short cable avoids snagging and ensures reliability. For the operator the truck is a delight to use with it's positive 'click' over-centre 'off' position and super light action brake lever.